By buying this product you can collect up to 346 bonuspoints. Rear tipper lorry (Mag. Sat.) light green, 1959. Tractor unit with light green driver's cab and glazing in topaz. Chassis and Cardan part as well as fenders and wheel rims grass green. Driver's cab with side door handles silver-painted and Magirus-Deutz lettering. Front window surrounds silver. Radiator grille with grass-green grille surface and silver ornamental frame and silver-painted Magirus logo. Tractor unit indicators painted by hand. 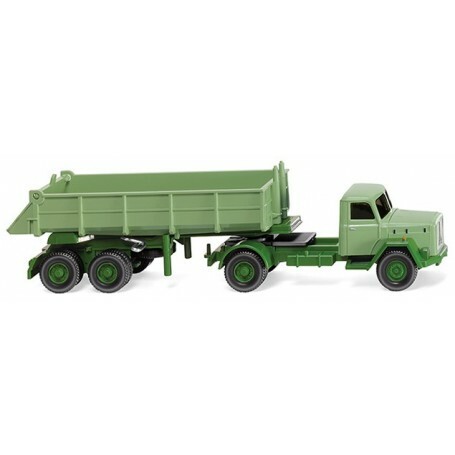 Semi-trailer with grass-green chassis, tipper receptacle and axle cover. Long bed with light green tailgate. Wheel rims grass-green.